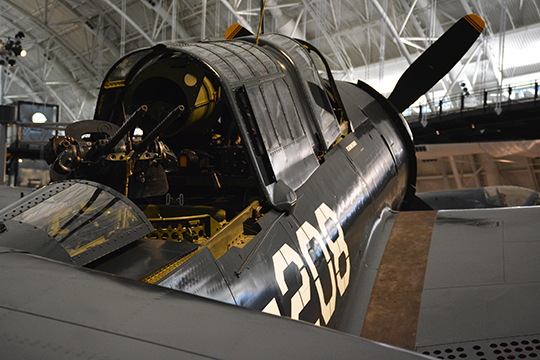 A World-War II era Curtiss SB2C-5 Helldiver was unveiled at the National Air and Space Museum’s Steven F. Udvar Hazy Center in Chantilly, Va. April 1. The Helldiver was the last purpose-built dive bomber to enter Naval service and was designed as a replacement for the smaller SBD Dauntless dive bomber. By the end of WWII, guided bombs and rockets eliminated the need to point the entire airframe at the target in order to insure a successful bomb run. Perhaps the most historic accomplishment of Helldiver aircrews was the sinking of the Japanese battleship Yamato. 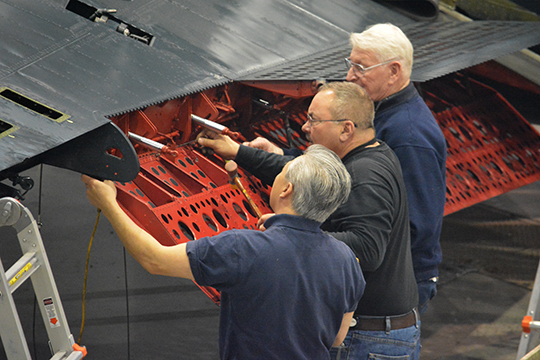 Restoration specialists from the Smithsonian’s Mary Baker Engen restoration facility at the Udvar-Hazy Center attach flaps and dive brakes onto the left wing in the final days of the aircraft’s re-assembly. 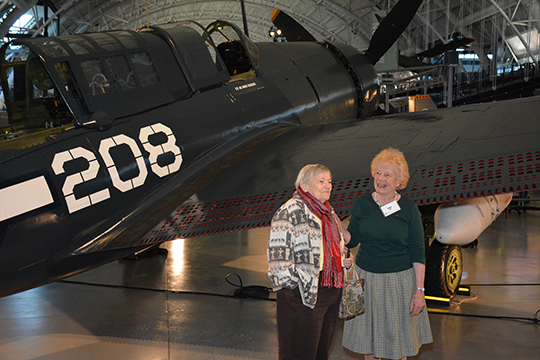 The restoration hangar is named for the wife of former FAA chief, Navy Vice Admiral, and SB2C pilot, Donald Engen. Former Curtiss Aircraft employees Betty Maskett (empenage fabrication) and Jackie Davis (quality control) stand in front of an aircraft they helped design and build 60 years ago. The women — members of the Curtiss Cadettes — were recruited in the 1940s by the manufacturer to learn aeronautical engineering due to manpower shortages at the height of the war.